Welcome to about Tennis Event Guide – your guide for all Tennis Events around the globe. My name is Melissa and I am a tennis fanatic who loves watching and playing tennis all around the world. Whatever ATP, WTA or Grand Slam event is on your bucket list, I hope to be your insider source to watching professional tennis and finding the best tickets, hotels, information about the area, things to do, transportation and much more. We scour hotel reviews, find the real details on best Center Court seats, when the qualifying rounds are, Kids’ Days, hotels near subways or walking distance and much more. 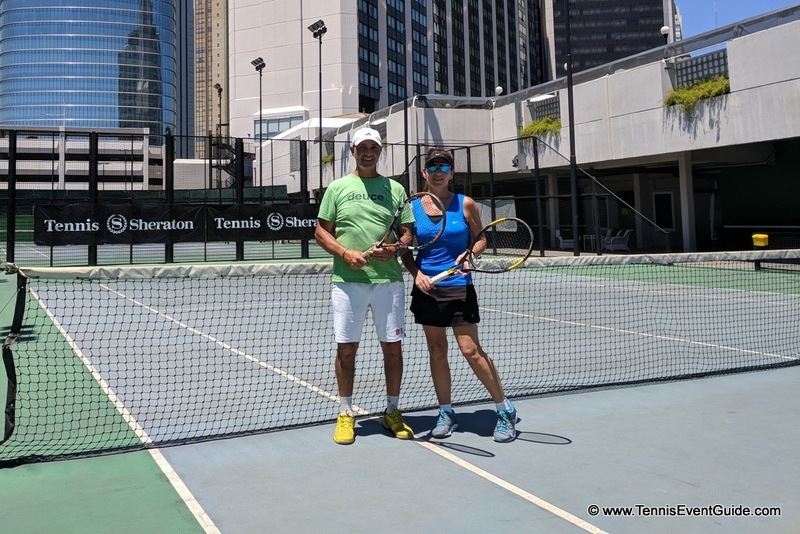 I love to play tennis anytime, anywhere and when I travel the world, where to play tennis is usually the first thing I discover about the area. I’ve chosen hotels based on whether they had courts and pros available, cities and beaches based on the tennis availability or ATP events happening and even more, but I’ll stop there so you don’t think I’m completely nuts. As a native New Yorker, I’ve been to the US Open at least 40 times and can probably answer most questions you may have about it. Miami, BNP Paribas, Qatar Open, Davis Cup? Loved them all. The rest are on my bucket list and I figured as long I was going to do the research anyway, why not share it with you? I love tennis boot camps and resorts (read my reviews on Thanyapura, Total Tennis and more) and am usually the person people ask first if I’ve been to a place and my opinion of it. How much tennis is there? Did your game improve? How were the courts? The pros? More singles or doubles? How was the food? Recently, I was "stuck" on an unexpected 18 hour layover in Doha, Qatar, but before you say Oh No!, the Qatar Tennis Open was in session and within an hour of landing, I had a hotel, tickets and was on my way to watch an amazing match between Coric and Carreno Busta and I’ve now written it all up for you to make it as easy as possible to head to the Qatar Open. I also love websites – so if you add up tennis + websites + travel, you get Tennis Event Guide, my personal labor of love. I hope to do all the best research for you (and me!) so we can all watch as much professional tennis around the globe, including finding the best tickets, winning the lottery, scouring hotel reviews, things to do, transportation and much more. Should you get a day or night pass? What time can you enter the grounds? Are the qualifying rounds free? Does a Center Court ticket get you access to the entire grounds? All those little details that can make our experience of watching tennis that much better. Welcome to Tennis Event Guide! Please stay a while and feel free to comment, provide feedback or send me a note. Cheers to your next Game, Set, Match!!! Thank you for visiting TennisEventGuide.com. This is my personal site and I am not directly paid by any company for writing the content on this site. Every word and link on this website is published at my sole discretion and is not influenced by any form of payment. However, I do sometimes receive compensation if you purchase some things (like hotels or tickets) through the links provided, and this is one of the ways I am able to provide you all the free information on this website. The information provided on all pages is unbiased and accurate to the best of my ability. I do not have links for anything on my site that will require you to pay any additional fees because of my relationship with them. As a matter of fact, many times these relationships save you money.